ASDIP Structural Software releases regular updates to ASDIP CONCRETE (Version 3) structural engineering software. Utilize ASDIP CONCRETE software for the design of biaxial columns, multi-span continuous beams, and out-of-plane bearing walls. Following are some features included in this version 3. This structural engineering software offers three levels of design results such as At-a-glance, Condensed, and Detailed. ASDIP CONCRETE 3 fully complies with ACI 318-11 (no fundamental changes occurred in the new edition ACI 318-14). 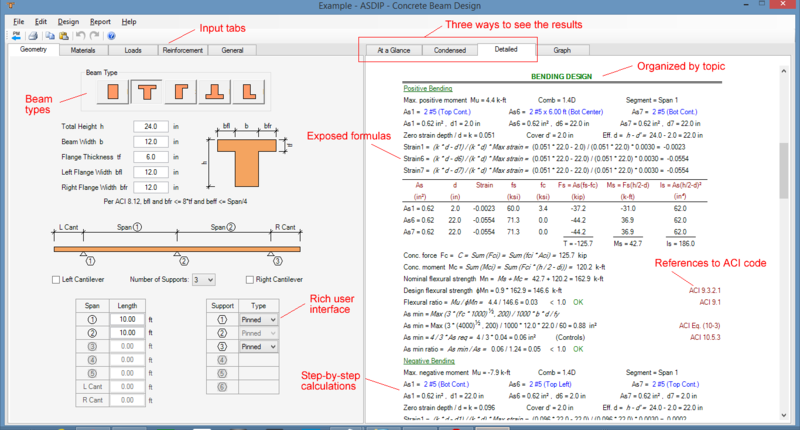 New Detailed tab, with step-by-step calculations and exposed formulas with references to the design code. Two stress-strain options for concrete: either Hognestad parabolic curve or Whitney block. Two stress-strain options for steel: either Elasto-plastic or Strain-hardening. 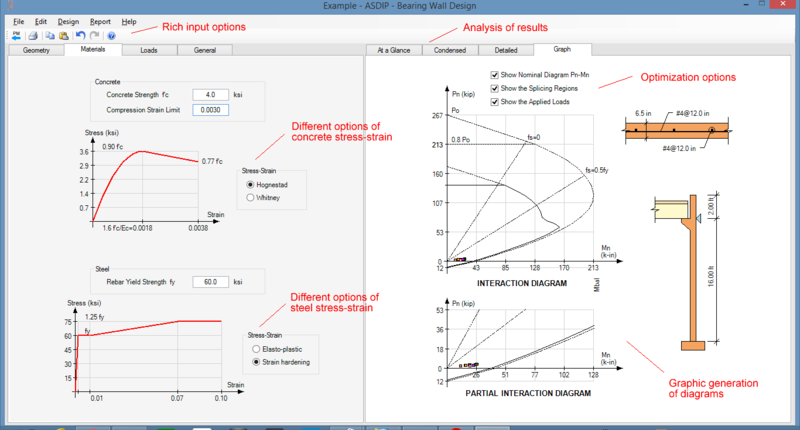 ASDIP CONCRETE software generates graphs of the interaction diagrams for walls and columns. This structural engineering software accepts either pre-combined loads, or a set of nominal load cases per ASCE 7-05 or ASCE 7-10. Copy loads information to other segments to simplify the data input. 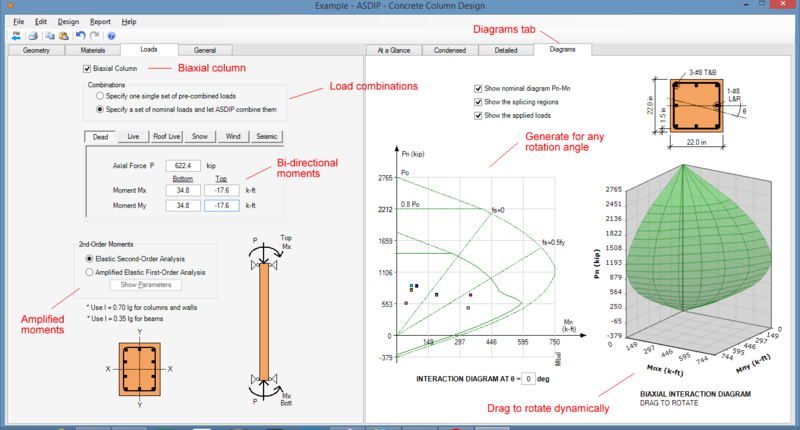 ASDIP CONCRETE 3 includes the design of biaxial columns. The 3D interaction diagram is generated by rotating the section multiple times (exact approach). Complete amplified second-order moment analysis in both directions for biaxial columns. Rotate the 3D diagram by dragging with the mouse. This structural engineering software includes the complete deflections analysis of continuous concrete beams. The deflections analysis includes the short term and long term deflections per the ACI. Detailed information is available about this structural engineering software by visiting ASDIP CONCRETE. You are invited to download a Free 15-Day Software Trial or go ahead and ORDER NOW. I NEED THE RAFT FOUNDATION DESIGN SOFTWARE ..
HOW CAN I GET TRIAL VERSION OF IT. ALSO I REQUIRED FLAT SLAB SYSTEM. Sorry, at this moment we don’t have a module for raft foundation design. Yes, you can specify US, SI, or MKS units.